HAUT is envisaged to be the world’s tallest timber residential tower. Image courtesy of Team V Architectuur. The wooden residential building will be a part of Amstelkwartier neighbourhood. Image courtesy of Team V Architectuur. Distinguishing features of the building include its large floor-windows that provide beautiful views of the surroundings. Image courtesy of Team V Architectuur. The cantilevering balconies are designed in a random pattern. Image courtesy of Team V Architectuur. At 73m, the tower has 21 floors and includes 55 housing units. Image courtesy of Team V Architectuur. HAUT is a proposed residential tower that will be constructed in the Amstelkwartier neighbourhood of Amsterdam, Netherlands. The tower will become the world’s tallest wooden residential building. Located on the River Amstel between Oud-Zuid and Watergraafsmeer, Amstelkwartier includes 4,000 residential units, in addition to retail and small business areas. 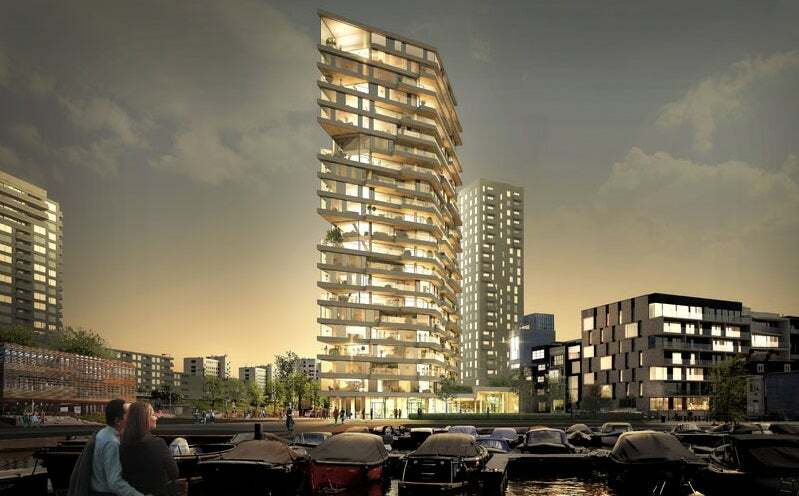 The Amsterdam municipality selected Team V Architectuur on 20 July 2016 to design and develop the city’s tallest timber tower. Construction of the innovative, sustainable and environment-friendly building is scheduled to start in the second half of 2017. "The building is designed to achieve BREEAM Outstanding label." Wood is an internationally favoured building material due to its large carbon dioxide storage capacity. It also supports the Municipality of Amsterdam’s plan to achieve net zero carbon footprint through sustainable construction. The building is designed to achieve BREEAM Outstanding label. The design of the residential building draws inspiration from its name, which stands for ‘haute couture’ or tailor-made architecture. The residential building has been designed to provide prospective buyers with the choice to alter the various aspects of the units such as size of their apartment, the number of floors, the layout and the positioning of double-height spaces, outdoor loggias and balconies. Offering exceptional views of the surrounding are the large floor-to-ceiling windows and ample terraces along with spacious balconies. The appearance of the building is further enhanced by its distinct light grey floor bands. With wooden ceilings and their large projections at the sharp building corners, the balconies bestow an iconic appeal to the tower. The balconies are designed as cantilevering structures that appear to be placed in a random pattern. A triangular plinth named Hortus is designed to function as a green area during the cooler months and will host community gardening programmes, encouraging residents to interact and participate. The plinth will be accessible to general public, pedestrians and visitors to the adjacent Somerlust Park. The main structure of the residential building will be made of cross-laminated timber in the form of prefabricated panels. A load-bearing wall construction will be used for the tower’s structure, while wall and floors will be made of cross-laminated timber. Concrete will be used only to construct the basement including the underground car park owing to the high ground water pressure. The connecting path between the basement and the wooden high-rise structure will be constructed of concrete. Certain areas of the ground floor and first floor structure will also require concrete as the construction material. The building’s facade will be completed using glass, aluminium and concrete. The cross-laminated timber that will be used to build the tower will store approximately three million kilograms of carbon dioxide and will be made from European softwood acquired from sustainably-managed forests. The use of softwood contributes to a no-waste timber production as its quality is enhanced upon the use of durable adhesive techniques. The facade of the building will include energy-generating panels across an external area of 1,250m². Waste water will be collected and decontaminated by means of filters fitted on the roof. The garage space is equipped for electric car sharing. The 73m-high residential tower will have a total gross floor area of approximately 14,500m² and include 21 floors. It will house 55 apartments and an underground car park and a bicycle storage space occupying 2,800m². A public plinth covering a gross floor area of 1,100m² and including the urban winter garden, Hortus will be built. An innovation lab will be located at the tower’s ground floor, HAUT NLE, which will be a leading destination for energy innovations. The team developing the HAUT includes urban developers, Lingotto, Nicole Maarsen, Arup and brand partner NLE. Arup will provide engineering services such as building services, engineering, fire, acoustics and building physics consulting.